Graduation season is upon us, a rite of passage so significant whether the graduate is leaving kindergarten or medical school. Whomever you’re honoring, you’re probably planning a party and need a few ideas. You’ve come to the right place—we have an idea or two to get the party started. What could be easier and more satisfying—especially if you’re feeding hungry high school or college grads—than a do-it-yourself sandwich bar? DI LUSSO® products are at the ready. 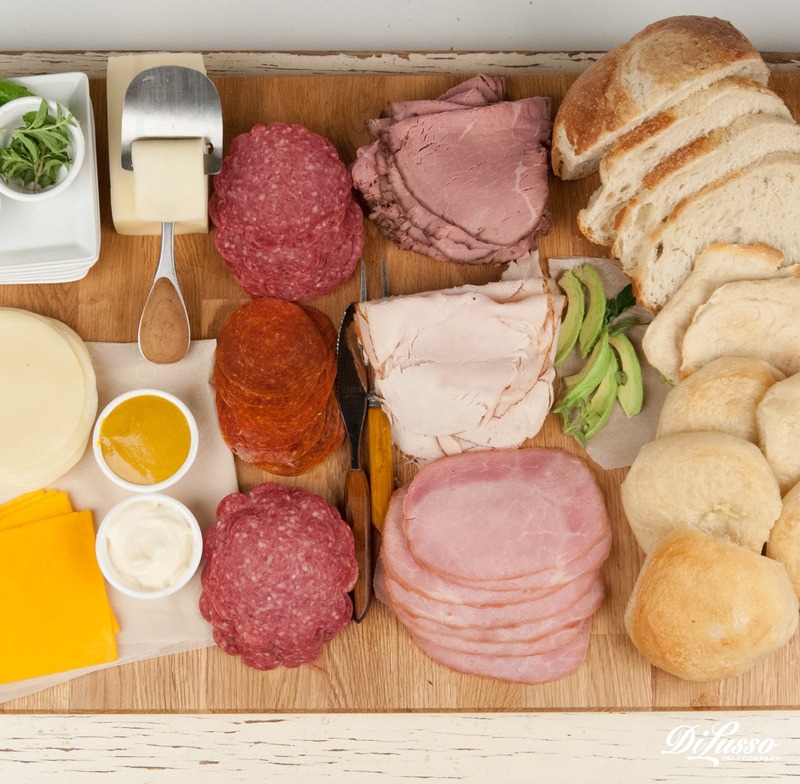 Just stock up on a variety of DI LUSSO® meats and cheeses according to how many people you’re expecting. As a general guide, figure 1 lb. of meat and cheese per 5 to 6 sandwiches. The sandwich bar starts with the bread. Have baskets or platters filled with a fun assortment: white, whole wheat, rye, marble; pitas and flatbreads; ciabatta rolls, poppy seed rolls, brioche, slider and pretzel rolls, etc. (Make sure all rolls are split for easy assembly). Next in line, platters of meats and cheeses. Don’t forget the serving utensils such as tongs or serving forks. 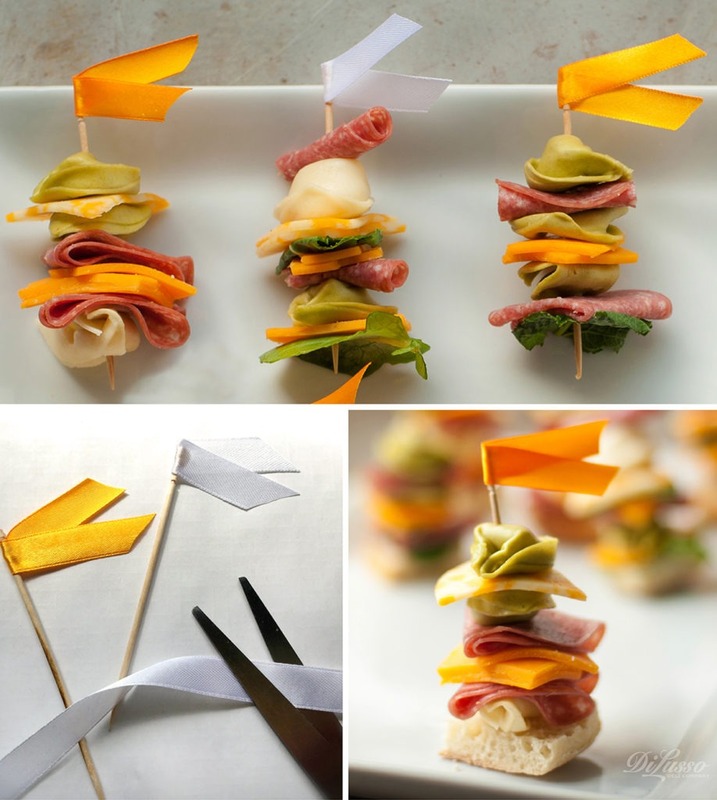 Arrange the meat and cheese slices attractively, alternating orange cheeses with white ones; round salami slices with tempting turkey; beef, then ham, etc., to make it easy to differentiate. And now the add-ons. We can help here, too, with DI LUSSO™ condiments that make an ordinary sandwich something very special, including mustards, aiolis, and olives and peppers. Lettuce, onion, tomato and cucumber slices add crunch and color. 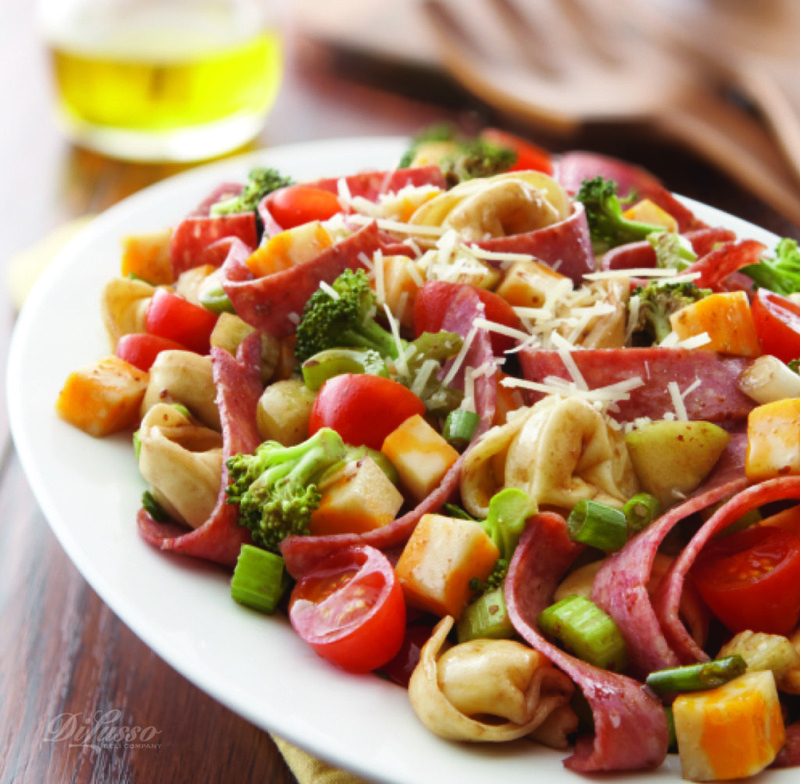 A big bowl of Insalata di Pasta, made with cheese tortellini and a mélange of veggies, meats and cheese, can be made a day or two ahead and would be a great accompaniment to the sandwich bar. 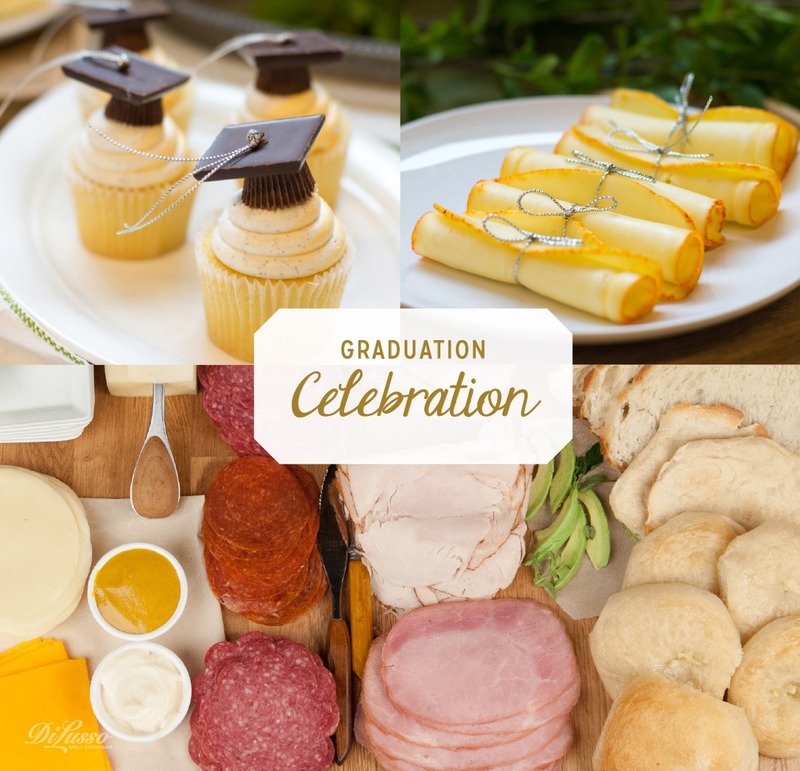 Tip your hat to the grads with cheese “diplomas”—just roll up slices of any white DI LUSSO® cheese (Havarti or Muenster) or turkey and tie each with a ribbon matching school colors. Just because they’ve graduated doesn’t mean they’ve advanced beyond the dessert years. (Does anyone, ever?) You can never go wrong with a dessert table filled with brownies, cookies, and lemon bars. Or make these darling cap-and-gown cupcakes with chocolate-bar squares and mini peanut butter cups. Go for a color scheme of school colors and add banners, streamers, balloons, pennants, etc., to acknowledge the grad’s alma mater. Many people enjoy seeing a montage of photos of the graduate, too. Good luck, class of 2017!